It was Friday, May 3, the day after Jeff Hanneman departed for the great gig in the sky. 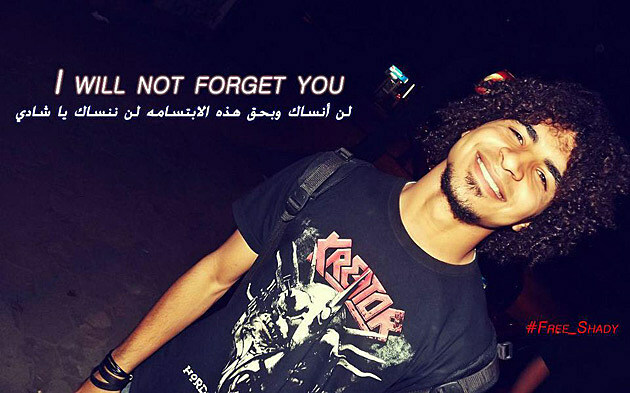 In Hanneman’s memory, 24-year-old Safy Averse El Den put on his Slayer t-shirt before heading into downtown Cairo for an afternoon meal with friends at a cafe. Like Safy, the others were dressed in classic metalhead gear: black shirts celebrating Metallica, Opeth, Pink Floyd, and other bands. That’s likely what attracted the attention of the men who advanced on them, snatched the food from their table, tossed it in the trash, and then grabbed Safy and his friends. At first, Safy thought they were patrons picking a fight. Then the men identified themselves as police and ordered the group outside. Safy and five of his friends were arrested that afternoon, including Refaat “Shady” Khaled, Ahmad Hashim Manch, Mahmoud Haggag, Jehan Faisal Mohammed, and Medhat Mohamed Reza Qasim (who goes by “Brutal Mitch”). The officers packed them into police vans and then did something odd: drove them east to the station in Moski, rather than the one closest to downtown Cairo. “They did that in order to take us to a place where no one will be able to reach us,” Safy says. Once they arrived at the station in Moski, the police confiscated everyone’s cell phones, money, and identification. They questioned and beat several of Safy’s friends, including 18-year-old Jehan, a woman. Some who made the mistake of asking what was going on were tased. Safy kept quiet, knowing what would happen if he didn’t. It got even weirder. The police forced them to put on dark sunglasses and tie black scarves around their faces. Then they took pictures. The youths were divided into smaller groups. Most of Safy’s friends were taken to Al Darb Al-Ahmar station, but Safy and Ahmed were held Moski’s cells overnight. 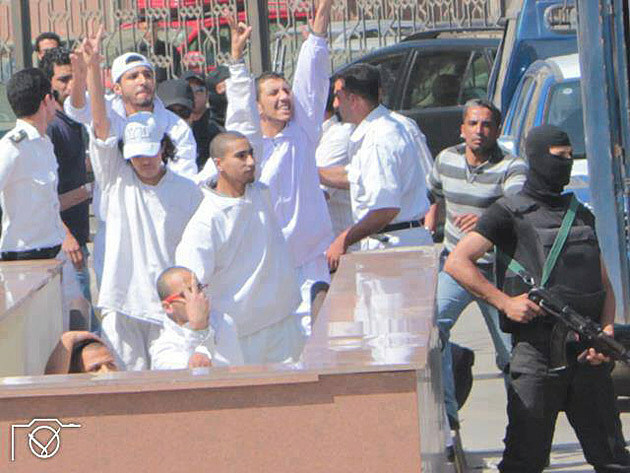 The next morning, they were brought to the Al-Glaa Court, where they were questioned by the Azbakeya Prosecution. That’s when the reason behind the arrests began to emerge. The police explained that black bloc protesters had been destroying property in downtown Cairo the day before, but when the police arrived, the demonstrators predictably fled. The officers told the court that they later caught up with some of the protesters in a cafe, dressed in black. As evidence, they showed the photos of Safy, Ahmed, Jehan and the others masked in black bandanas and sunglasses. The prosecution ordered that they be held for 15 days. After the hearing, they were taken about a half hour south of Cairo to Tora Prison, notorious for its high-security “Scorpion” block, where ousted Egyptian president Hosni Mubarak and anti-authoritarian blogger Alaa Seif al-Islam are reportedly held. In Tora, Safy and Ahmed discovered they weren’t alone. “We met 21 guys exactly like us,” he says. Although the beatings and torture decreased once they reached the prison, the men’s long hair was shaved off. On June 6, 2010, Egyptian Internet activist Khaled Mohamed Saeed was sitting in an Alexandria cybercafe when two detectives from the Sidi Gaber police station entered the cafe and arrested him. As the detectives led Saeed to their car, they beat him and smashed him against objects, ultimately killing him, as multiple witnesses later reported. Afterward, the police claimed Saeed had been arrested on charges of theft and weapons possession, that he had resisted arrest, and that he had suffocated while trying to swallow a packet of hashish. More than a year later, the detectives were found guilty of manslaughter and sentenced to seven years in jail. The Ministry of Interior’s police division contains two sectors: State Security Investigations (SSI) and Central Security Forces (CSF). When Mubarak became Egypt’s president in 1981, the SSI had become the country’s most powerful police unit, with 100,000 officers and other employees. It was during the SSI’s power heyday when, on January 22, 1997, police burst into the homes of more than 100 metalheads who were settling into their beds for the night. Most of them were regulars at a place called the Baron’s Palace, an abandoned villa turned hangout for the city’s metalheads. After the arrests, one Egyptian paper claimed the villa was “filled with tattooed, devil-worshipping youths holding orgies, skinning cats, and writing their names in rats’ blood on the palace walls,” according to Mark Levine, author of Heavy Metal Islam. The “evidence” against these suspects, some as young as 13, included CDs and cassettes, posters, and black t-shirts. They were interrogated on bizarre topics, including pagan rituals and cat-skinning, and spent up to 45 days in jail before a public prosecutor’s demands secured their release. The chilling effect on Egypt’s metal scene lasted for nearly a decade, and few metalheads who were old enough to know what was happening at the time will discuss it now. Since the revolution — and particularly since president Muhamed Morsi took office last June — the national conversation in Egypt has turned to police reform, with proposals from civilian groups, the Ministry of the Interior, political organizations, and even the police themselves. “Many [officers] are in need of psychological rehabilitation. The revolution broke some of them, while others became more brutal and violent . . . Both situations are equally bad,” Egyptian parliamentarian Tamer Makki told Ashour in an interview. But reforming Egypt’s deeply entrenched practices will take time, not least because the Muslim Brotherhood’s approach to the problem is “gradual . . . not revolutionary,” Ashour writes. Despite gestures toward democracy, Morsi and the Muslim Brotherhood’s leadership has sparked more protests. In January, near the second anniversary of Egypt’s revolution, alleged black bloc protests cropped up in Cairo, Alexandria and near the Suez Canal. 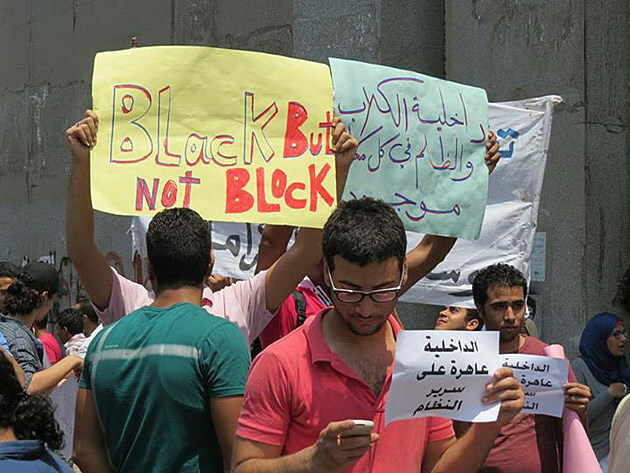 At the same time, the Black Bloc Egypt Facebook page appeared. It wasn’t long before public prosecutor Talaad Abdallah ordered Egypt’s police to detain anyone suspected of participating in such protests; he even encouraged citizens to arrest members of this so-called “organized group that participates in terrorist acts.” In early May, just days after Safy and his friends were arrested, an Egyptian court sentenced six other young men to five and a half years in prison for participating in black bloc activities, Reuters reported. Within a day of their arrest, friends and family learned that that Safy, Ahmed, Jehan, and the others were in jail. One of their friends, Mahmoud El-Kady, launched a Facebook page so he could rally others to stand outside the courthouse during his friends’ upcoming hearings. The arrests were particularly troubling for Mahmoud: the only reason he wasn’t with them that afternoon in the cafe was that was studying for his upcoming engineering exams. Safy is a tourism guidance student at Ain Shams University; Ahmed is studying graphic design aimed at advertising and promotion. All six of Mahmoud’s friends were detained just days before they were scheduled to take their end-of-term exams, a fact that weighed heavily on Mahmoud when I first spoke to him a few days after the arrests. Aly Adel, a friend of Safy’s, is a human-rights lawyer with experience defending others against similar black bloc allegations. He quickly became involved in Safy’s case, one of several lawyers who represented the group in court. When I asked Aly about the news reports covering these protests, he scoffed. The police have invented “a black secret organization scenario [so they] have a legal reason to arrest” people, he says. The pictures and news reports may show people dressed in black who are damaging property, but that doesn’t mean they belong to an organized criminal protest group, he says. The group appeared at the North Cairo Primary Court on Tuesday, May 7, where their attorneys argued that they were being held without cause and convinced the court to let everyone go. The judge ordered their release, but the prosecutors immediately appealed, forcing the youths to return to Tora. If this were an article about an American police-brutality and wrongful-detention case, I would be obligated to call the police department and the jail and give them a chance to tell their side of the story, even if they only said, “no comment”. The Egyptian police, apparently, are another matter. I attempted to reach them, both directly and via Interpol, but my attempts went unanswered. Likewise, emails to the Muslim Brotherhood in Egypt — which has gone so far as to hire a public spokesman, Yasser Mehrez, to talk to the press — fell on silence. Several of my Egyptian sources told me it was essentially impossible to reach the police, let alone get them to talk about situations like these. Following the January 2011 revolution, Egypt’s police force has continued to suffer a reputation problem, though for slightly different reasons. Instead of being out on the streets in force, they have withdrawn, a decision that has left the streets “increasingly lawless,” writes BBC reporter Shaimaa Khalil. Khalil was allowed inside one of Egypt’s police academies, where new cadets claim the force’s philosophies and training methods are changing, with a new focus on protecting human rights. But as long as officers remain out of sight, the public feels abandoned — and, at the same time, reports of police brutality continue, Khalil says. The prosecution’s appeal was heard Thursday, May 9, this time at the South Cairo Primary Court. After taking arguments from both sides, the court ordered the youths’ immediate release. At first, Safy didn’t believe it. “I was expecting something like taking us to somewhere else, or something like that,” he says. Already, Safy and his friends are getting back to their lives. Jehan and Shady are engaged to be married. Safy has returned to his band, Metaphorphoses, which struggles to find an audience in a country that still harbors little love for heavy metal. “Our lyrical theme is about inner struggles and human suffering in this country and also in the whole world,” he says, “[and] knowing right from wrong and how to fix it.” He’s unlikely to lack inspiration anytime soon.